When Lt Charles "Chuck" Spencer of Peoria, Illinois was awakened for the mission on the morning of Nov. 26, 1943, it seemed just like any other morning in the life of a combat crewman. Today would be his 16th mission since he arrived at Molesworth Air Base in July. some four months before. As he walked through the pitch dark, blacked out airbase to the mess hall, he thought to himself, "Just 10 or more missions and I get to go home to see Jeanne and a stateside assignment where we can be together. " Since this was a pre-mission breakfast, fresh eggs, cooked to order, were on the menu. Usually the fare was a square omelette cooked with powdered eggs. Breakfast over, he made his way to group headquarters building for the first of two briefings. After the call to attention with the arrival of the commander, the briefing got under way with a time hack, and the usual spiel about the makeup of the various formations and their positions in the bomber stream. But the briefing really hit the climax with the raising of the curtain which covered the map. The intelligence officer raised the curtain to reveal the target. His first words were almost drowned out by hoots, jeers and catcalls. "The target for today is the City of Bremen. This is a maximum effort by the Eighth Air Force and the 303rd is putting up 35 aircraft. Since more than 500 planes will be attacking the same area, it is very important that you keep your assigned position in the bomber stream." Tracing the course on the map with a pointer, he continued, "You cross the enemy coast at this point at 22,000 feet and you go along this route to the l.P. The bomb run is about 40 miles and it should take you about seven minutes. Flak in the target area should be moderate to intense. Fighter opposition should be expected along the entire route. We estimate that the Luftwaffe can put up about 200 aircraft to try and stop you. Good Luck." After the general briefing, there were short bombardier and navigator briefings. Spencer, who graduated from Bombardier school at Midland, Texas in early '43 joined the Bombardiers. "This is no milk run," Spencer said to his pilot, Lt. William C. Fort of Fort Meade, Fla. as they boarded the truck, which was taking them to Stardust, their assigned aircraft for today's mission. Spencer's words proved to be very prophetic, but little did he know that the mission to Bremen would change the course of his life and in fact almost take it. The takeoff of the heavily loaded bomber, the assembly and flight to the I.P. were normal and routine with a few exceptions; the winds at flying altitude were in excess of 120 miles an hour and the temperature was more than 55 degrees below zero. 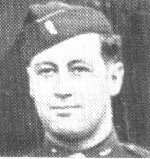 The Navigator, Second Lieutenant Harold J. Rocketto, of Brooklyn, N.Y. - on his first mission - was killed instantly by machine gun bullets. Stardust was knocked out of formation, but Lt. Fort maneuvered her back into formation and gallantly continued over the target He didn't know that the bombardier Lt Spencer was unconscious. The latter cut about the face by broken glass, his helmet and oxygen torn away, lay gasping for breath as the frigid winds whipped about his head. When engineer T/Sgt Grover C. Mullins, Windsor, MO., entered the nose to check the damage, he found Lt. Spencer on the floor, bleeding and frozen. He dragged him into the passage beneath the pilot's compartment and tried to give him oxygen. "His face was so swollen I could hardly see his nose," said Mullins. But Sgt. Mullins was a busy man. He had to assist the co-pilot whose oxygen mask had been shot away, too. And he had to drop the Stardust's bombs himself, because the release mechanism had been smashed. So he left Lt. Spencer in the passage semiconscious and apparently close to death. "He seemed to have one idea in the back of his mind," said Sgt. Mullins. "He thought he ought to release his bombs and man his guns." "He was still conscious enough to crawl back, and after we landed I found him unconscious beneath his guns." The co-pilot, Lt. McDonald Riddick of Beaumont, Texas, said Lt. Spencer insisted on getting back to his guns, " and he even struggled to get there, although all he could do at first was to roll over." When he was rushed to the hospital in England, Army doctors told Spencer that he would spend the next two years of his life in a hospital and he would be crippled for life. For "gallantry in action," Lt. Spencer was awarded the Distinguished Service Cross. For Lt. Spencer, the war in Europe was over, but the fight to survive and live a meaningful and rewarding life was just beginning. What happened to this heroic American who was recommended by his superiors for the highest award for gallantry is a story in itself. Although the mission which changed the course of his life happened more than 40 years ago, he still remembers things quite clearly, "We got a 20 millimeter cannon shell through the plane which blew the nose off, killing the navigator beside me and hitting me with fragments," he said. Most of my injuries were from severe frostbite. My facial features, nose and ears (new ones were made) were frozen. My hands were so frozen that the fingers had to be amputated. The tip of my toes were frozen. One eye had to be enucleated, the other was impaired." The freezing temperatures also helped to save his life. It kept him from bleeding to death from injuries caused by the shell fragments. Spencer spent four and a half months in England for primary reconstructive surgery. Then, he underwent two and half years of cosmetic surgery, some 36 operations - in the Valley Forge Hospital in Pennsylvania. During that time, the palms of his hands were split so he could use them like pincers. It was during his stateside hospitalization that faith redirected his life toward the ministry. "I really thought I was going to die," he said. "It was a period of great darkness. I prayed and I asked God for mercy for me, for my loved ones back home. Later on I felt that God had saved my life for a purpose. It was miraculous." Jeanne, his wife, began reading the Bible to him. They began to make plans for him to attend a seminary. "I would have had an awful struggle if she hadn't been beside me," he said. "She was my eyes for a long time and still is today." He graduated from Central Baptist Seminary at Kansas City in 1951 and finally fulfilled his new quest. In December of 1953, he went to Fort Dodge after four years as a minister in Willard and Whiting in Northeast Kansas. Despite the physical scars of the war, - his face is badly disfigured and he is blind in his right eye and has only travel vision in the left - he maintains a deep deep abiding faith in God and mankind. In 1953, the Rev. Charles Spencer became the Chaplain of the Kansas State Soldiers Home at Fort Dodge, located five miles east of Dodge City. Spencer was the Chaplain at Fort Dodge, a state facility for a few hundred disabled, retiree and sometimes forgotten veterans and widows of veterans, for almost 30 years. "My physical appearance may have made some people a little squeamish, but the greater percentage haven't taken my disfigurement as a bar from the ministry," he said. "In fact I think it helps in many ways to make people think a little less of their ailments in life." His days at Fort Dodge began early and ended late. He was available days and nights and weekends for people in need. He tried to establish a "work day" but no one was ever turned away even if it was after 5 p.m. on a Saturday. Spencer remembers the white chapel at Fort Dodge which was in the heart of the Soldiers Home. The chapel, built around 1910, had pale green walls and a striped rug. His wife served as the church organist since the Spencer family came to Fort Dodge in 1953 and Spencer himself rang the church bell by hand every Sunday morning. His love for mankind was manifested in the way he performed his daily rounds at this little known and ofttimes forgotten Home. His rounds included stops on the way to talk to some elderly veterans, then off to the infirmary to talk to a silver haired elderly woman. She just needed company and thanked him for the brief visit. She promised to pray for him. Spencer thanked her and moved on. A woman, sitting in a wheelchair, chatted with him saying she missed her children and grandchildren, wishing they would visit more often. Spencer patiently listened. "They often poured out their hearts and heartaches to me. They got it off their chests, then they felt better," he said. "I was a good listener." Spencer explained that loneliness was a frequent problem faced by members of his small congregation. They brought to me the gamut of their problems. The list included attempted suicides and alcoholism, but the common denominator was the stone-coldness of being alone. The aging veterans in the halls had survived the bad years, mustard gas and the Germans. Time hadn't been kind to them. Many of their relatives had moved to other states or distant cities. They had forgotten to write frequently or call occassionally. "Some of them felt bitter. They felt that they were abandoned by their children, but it was usually not the case. Their children had lives of their own. And they felt it was the best thing to send them to Fort Dodge. It was sad," he said. Very often he found himself being looked upon as a beacon of hope for these unknown and forgotten veterans. He cared for their religious needs, was at their bedside when they were very sick and he comforted them as death approached. He often reminded his congregation that, "We are all God's children and He cares for us very much." During his last few years at Fort Dodge, he suffered a couple of heart attacks which slowed him down a little. But he still maintained an active religious program and conducted the services and prayer meeting throughout the week at the various halls housing men and women. He occasionally thought of the future and looked forward to retirement in 1982 when he became 65. He eagerly looked forward to the time when he could go on a year long sabbatical, then returning to help out at the First Baptist Church in Dodge City. The retirement years still finds him just as busy as ever. He helps in the ministry at the First Baptist Church at Dodge City. He looks forward to traveling with his wife, visiting friends as far south as Giddings, Texas to visit an old Navy Chaplain. They both look forward to visiting their son, Tom, now living in Tucson, Arizona. Another son, Robin, was killed in an airplane crash in 1978 in Kentucky. Recently Jeanne formed a band called the "Prairie Pipers." It has seven - sometimes eight - members ranging in age from 60 years to an 87 year old lady who plays a harmonica. Spencer plays the big harmonica and his wife Jeanne, plays the electronic keyboard. They play at the Senior Citizen Centers and other centers around Dodge City. The death of his youngest son and the scars of war have not diminished his strong faith in both mankind and man's Maker. His wife Jeanne and the Bible are his constant companions. "I think the Lord has been good to me," he said. "He cared for us well." In my opinion, the military made a mistake years ago when they failed to award their highest military decoration, the Medal of Honor to Lt. Charles Spencer but I'm sure in the eyes of his Maker, Lt. Spencer will always be "Top Gun." Reverend Charles "Chuck" Spencer, whose 8th AF injuries caused him to become completely blind, passed away on April 16, 1998. 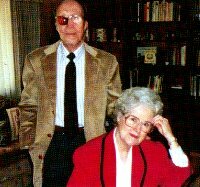 He had lived in Dodge City, Kansas and had been married to his wife Jeanne for over 56 years.